Back in 2015, I was given the opportunity to review the book Side by Side by Jana Kelley. It was a realistic and an enjoyable read, which I was excited to hear is turning into a trilogy. The second book in the series was published this year, and is called Door to Freedom. I was very happy to be offered the chance to review it as well! These days there seems to be some sort of hype-driven fear that all Muslims are evil and just waiting for their chance to kill someone. This book helps to drive that unrealistic fear away and shows that Muslims are people just like us, with friends, with family tensions, with hopes and dreams, but mostly with a deep need for the peace that comes only from the Gospel. As with Side by Side, it was wonderful to feel as if I was back in Sudan through all the descriptions in the book. I could feel the grit of the dust, hear the honking of rickshaws and taxis, taste the food, and feel the heat. In Side by Side, we meet Halimah who is a convert to Christianity and has to flee and leave her family and all she knows behind to save her life. We also meet an American couple, Mia and Michael, who are working in Sudan with an aid organization. Door to Freedom is set about a year later. Rania, Halimah’s sister, misses her sister dreadfully and expresses her feelings through art. She keeps thinking about her sister’s courage and eventually she builds up enough courage to read the book of John that Halimah had left behind and she becomes a Christian. Soon she faces the prospect of marriage to a much older cousin, but her mother steps in and convinces her father it would be a good idea to send her to live with family in Dubai where she can also study art. We are left at the end of the book with the hope that Rania’s mother might also be on the road towards putting her trust in Jesus. Mia and Michael have matured more in their faith and have become more bold in their witness, and experience various trials as a result of that. 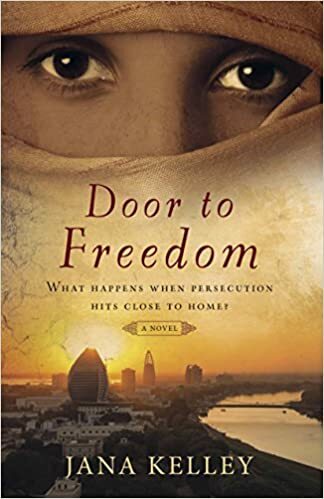 In fact, Door to Freedom deals with some more of the difficulties of living in a country like Sudan in more detail, including a fairly tense few chapters where Michael is under investigation by the police. I loved seeing how the characters have developed and matured, and how Michael and Mia have increased in their boldness in sharing the Gospel. There was, however, one thing that didn’t sit right with me: the ‘lone ranger’ type of work Michael and Mia were doing. From my experience (which was, I admit, pretty limited) in Sudan, Christians stuck together and supported each other, even when they were not working with the same organization. In the book, Michael and Mia lead a couple to Christ and even baptize them, but without other Christian witnesses and with seemingly little long-term Christian support and discipleship. There might well be an explanation for this, but it struck me as odd. It’s also odd to me how little other Christians feature as a support network for Michael and Mia — we do hear about them going to church, but it doesn’t seem to be a large part of their lives. Maybe we’ll see more Christian support for them in the next book? Overall, I really enjoyed reading Door to Freedom, and I’m very much looking forward to reading the next book. I should mention that while this is a series, each book stands on its own pretty well. Get yourself a copy, or enter the giveaway to win! I received a complimentary copy of Door to Freedom but have not been compensated in any other way for this review. 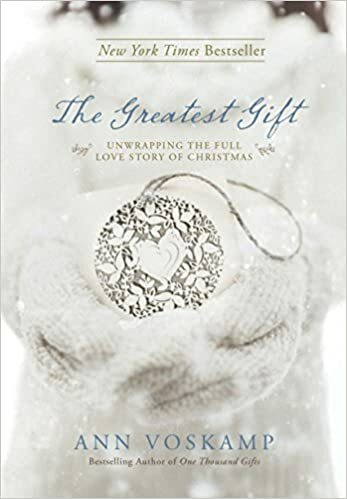 A couple of years ago, I really enjoyed reading through The Greatest Gift by Ann Voskamp for Advent. This year I’m trying to be organized enough to remind you that if this is something you’d like to buy, now’s a good time, with Advent being just two weeks away and all! This is not a sponsored post or anything, I just really loved to book and wanted to share it with you guys! I don’t have the ornaments that go with the devotional, nor will I have time in the foreseeable future to make any, but that doesn’t detract from the book at all, in case any of you were wondering! For your interest, here’s a list of some of the books we’ve read in the last year or so, with a tiny summary of each. Most of them are really good. I’ve put B after the author’s name if only I’ve read it, F if just Franci’s read it, or BF if we’ve both read it. Feel free to ask further about specific books if you’d like! The Reason for God by Tim Keller (B). Great book by the well-known New York City pastor answering doubts about and defending the Christian faith from a thinking point of view. Total Truth by Nancy Pearcey (B). A lengthy but very readable look at how Christianity is not just a private matter, but should affect the public sphere as well. Some overlap with Keller’s book. The Hobbit, by J. R. R. Tolkien (B). I read this to Marica almost a year ago now. The Good of Affluence: Seeking God in a Culture of Wealth by John Schneider (B). A thought-provoking discussion about how wealth can be compatible with Christianity. Schneider critiques left-leaning folks such as Ronald Sider. A Tree Grows in Brooklyn by Betty Smith (BF). Really engaging novel written from the perspective of a girl from a very poor family in Brooklyn, set around 1912. The Dragon’s Tooth by N. D. Wilson (BF). Doug Wilson’s son has a serious imagination. A strange and full-on but compelling story, definitely American rather than British. Complete with its own book trailer video. One Thousand Gifts by Ann Voskamp (F). A book that transformed Franci’s outlook on life to becoming more thankful to God for everything — from the simple to the profound. My Name is Asher Lev and The Chosen (BF) and The Gift of Asher Lev and The Promise, all by Chaim Potok (F). Very readable and interesting novels, all about orthodox Jewish boys and their interaction with the “outside world”. When People are Big and God is Small by Ed Welch (F). An interesting look at keeping things in perspective, and overcoming the fear of man. Loving the Little Years by Rachel Jankovic (BF). A very encouraging look at how to pursue motherhood joyfully. One of Franci’s favourite books about mothering kids. A Book of Bees: And How to Keep Them by Sue Hubbell (F). A creative look at bee farming — Franci said it’s a great read whether or not you’ll ever keep bees. C. S. Lewis: A Biography by A. N. Wilson (B). Very interesting, though too Freudian for my taste, and somewhat factually incorrect. Here’s a thoughtful, critical review of this biography. The Four Loves by C. S. Lewis (B). Discusses four kinds of love: affection, friendship, romance, and charity. Very perceptive in places, though overall not one of my favourite Lewis books. Sleeping Murder and The Murder at the Vicarage by Agatha Christie (F). The first and last of the Mrs Marple detective stories. A light and easy read. Heaven is for Real by Todd Burpo (F). The account of a father whose young son had a near-death experience and described things he saw in heaven, despite never having been taught about those things. Franci said it was a fascinating read, even if she didn’t agree with it all. She was expecting much worse after reading this very negative review. Lord Peter (a collection of Lord Peter Whimsey stories) by Dorothy Sayers (F). Sayers is a fantastic mystery writer, and Franci marvels at how she comes up with such different scenarios for each of her stories. Charlotte’s Web by E. B. White (F). Franci read this classic to Marica recently. The Gift of the Magi and Other Short Stories by O. Henry (BF). Punchy, twist-at-the-end short stories. Wordsmithy: Hot Tips for the Writing Life by Douglas Wilson (BF). Short and fun book with things writers should think about. Not the usual list of grammatical advice. The Chronicles of Narnia, by C. S. Lewis (B). I just finished reading the last of these to Marica (for the second time). Brilliant, and they get better every time. 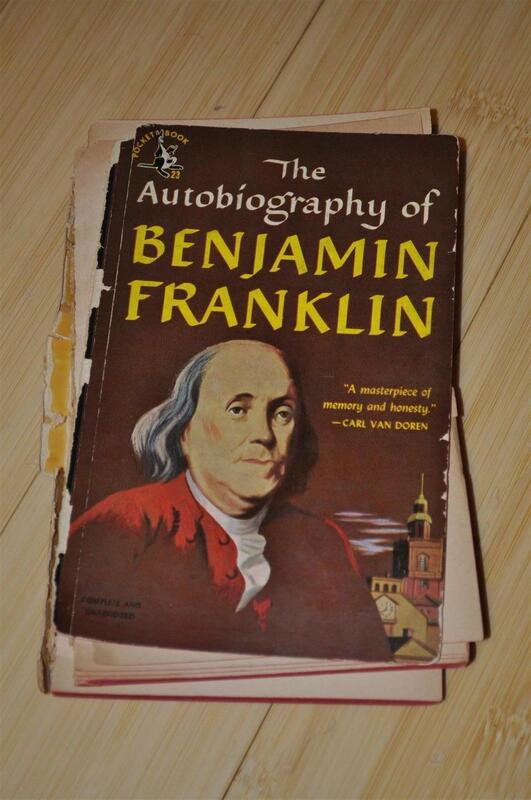 Some time ago Franci picked up a little, falling-apart paperback version of The Autobiography of Benjamin Franklin. As well as having a pretty respectable first name, Franklin was a fascinating character in many respects. Was he a printer, a writer, a politician, or an inventor? The autobiography is definitely worth a read. Franklin is direct, less than humble (and admits it) but not full of himself, and funny. You’d think something almost 250 years old would be a little tough going, but his writing’s very easy to read. I didn’t realise it till the very end, but he died before finishing it, and it stops almost in the middle of a sentence with an editorial note, “Unfinished”. Which translated, means, “Shortly after writing this paragraph, Benjamin Franklin died”. Because it’s olde literature, and no longer under copyright, you can read the whole thing online at Gutenberg.org and various other places. Or you can buy it from Amazon for a mere US$2.50. We know they had big families in those days, but we forget just how big. I remember J. S. Bach (more or less Franklin’s contemporary) had twenty children: seven with his first wife, who died, and 13 more with his next. But of Bach’s 20 children, only 10 survived into adulthood. Franklin was one of 17 children but, interestingly enough, they “all grew up to be men and women”. Was it the American air? Franklin also notes they “all married; I was the youngest son, and the youngest child but two” (p10). His father was into dinner-time conversation in a very deliberate way. Though I hope (for her sake) his mother was as pragmatic about the food as he was. Pages 14 to 78 — for which I didn’t make any notes — contained some interesting anecdotes about his early experience working as printer with his brother (they didn’t get along very well early on), how he taught himself to write well (which got him far later on in his life), and his first ventures in public affairs. Tho’ I seldom attended any public worship, I had still an opinion of its propriety, and of its utility when rightly conducted, and I regularly paid my annual subscription for the support of the only Presbyterian minister or meeting we had in Philadelphia. He us’d to visit me sometimes as a friend, and admonish me to attend his administrations, and I was now and then prevail’d on to do so, once for five Sundays successively. Had he been in my opinion a good preacher, perhaps I might have continued, notwithstanding the occasion I had for the Sunday’s leisure in my course of study; but his discourses were chiefly either polemic arguments, or explications of the peculiar doctrines of our sect, and were all to me very dry, uninteresting, and unedifying, since not a single moral principle was inculcated or enforc’d, their aim seeming to be rather to make us Presbyterians than good citizens. Strangely, Franklin says, “about this time I conceiv’d the bold and arduous project of arriving at moral perfection.” But for some strange reason “I soon found I had undertaken a task of more difficulty than I had imagined.” Really? Never would have guessed. Mostly worthwhile. But extremely pragmatic — no time for art, creativity, beauty, or enjoyment. “Always be employ’d in something useful.” Was it useful to anoint Jesus with thousands of dollars worth of perfume? And I didn’t know what venery meant, but point 12 in modern English means “hardly ever make love to your wife except for health reasons or to procreate”. How does the Song of Solomon fit into that? Apparently his “list of virtues contain’d at first but twelve; but a Quaker friend having kindly informed me that I was generally thought proud; that my pride show’d itself frequently in conversation … so I added Humility to my list” (p113). Very interesting. It’s easy for us Protestants to preach “always reforming” but not practise it — our creeds are written down, and have been for hundreds of years, never to be touched. I’m not at all advocating creedlessness (that is, chaos), but I do think the old Dunkers have a point here: things that have been written down a long time often seem “sacred”, when that should only be true of Holy Writ. Phew! And today we’d just call it “The Better Burner Book” or “A Fireplace that Saves the Planet”. In the rest of the book he talks a little bit more about his inventions (a better type of street lamp, for example), but a lot more about his political and quasi-military involvement. So for me it got less interesting toward the end. All in all, it was a very interesting read, providing insight into both the mind of quite a character as well as into some aspects of life in early America. For more info about Benjamin Franklin’s life, the Wikipedia article on him looks quite good. The Brothers Karamazov by Fyodor Dostoyevsky is a classic, or so I’ve heard. It’s one of those books so great and so worth reading that no one you talk to has actually read it. A 700-page novel is something of a commitment, but I approached this one with an open mind and a daily subway commute. I’ve heard writers are supposed to paint with words, but if so, Dostoyevsky sure uses a lot of paint: five-page dialogues, chapter-length digressions, extensive and unhelpful discussions about religion, the narrator going back and forth in “by the way, I need to tell you about this” blurbs … and the list could go on. All this in the midst of what could otherwise be a good story: a drunken, absentee father has three sons who aren’t exactly evil, but one of them ends up hating him so much that when the father is murdered, the son is accused of patricide. Sorry for the spoiler — I didn’t actually read that far — at page 200 out of 700 I was annoyed by the digressions, sick of being dragged again and again through the mud of human nature, and just plain tired of the verbosity. It’s not that I mind long books. At over 1000 pages, The Lord of the Rings is a good read (mild understatement). And for something I’ve read more recently, My Name is Asher Lev by Chaim Potok clocks in at 400 pages, but is a very engaging tale. So yes, I stopped reading a classic a third of the way through. Actually, the final nail in the coffin for me was when I found out (thanks Wikipedia) that The Brothers Karamazov was a great influence for Sigmund Freud. This was Freud’s favourite book? Ugh. No wonder I wasn’t enjoying it. So, Dostoyevsky, I don’t know how you’d say this in Russian, but in English we say that “brevity is the soul of wit”. Witty, Brothers Karamazov is not. But then again … maybe it’s shorter in the original Russian?